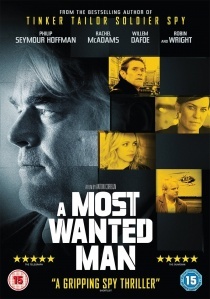 Released on DVD and Blu-ray by Entertainment One on 19th January 2015, adapted by Anton Corbijn from John Le Carré's acclaimed novel A Most Wanted Man is a smart and subtle psychological spy-thriller featuring an outstanding final lead performance from Academy Award winner Philip Seymour Hoffman. Adapted by Anton Corbijn (Control, The American) from John Le Carré's (Tinker Tailor Soldier Spy) acclaimed novel A Most Wanted Man is a smart and subtle psychological spy-thriller featuring an outstanding final lead performance from Academy Award winner Philip Seymour Hoffman (The Hunger Games, Moneyball). When a Chechen immigrant arrives illegally in Hamburg's Islamic community he rouses the suspicion of German and US forces of being a suspected terrorist. Seemingly penniless and brandishing torture scars, he holds a letter that states he's entitled to his father's fortune. With the assistance of a naïve but well-meaning human rights lawyer (Rachel McAdams, Midnight in Paris) he seeks access to the funds through a sinister private banker with corrupt connections (Willem Dafoe, Spiderman, Inside Man). Disillusioned and downtrodden espionage officer Günther Bachmann (Seymour Hoffman) leads a team that seeks intelligence from the local Muslim Community, and wants to use the accused Jihadist to gain insight into higher ranks. An American CIA agent (Robin Wright, House of Cards, Forrest Gump) has her own agenda but agrees to play the game. Stakes rise as all parties become embroiled in an intense power battle. But who will succeed and hold the fate of this sought-after man in their hands? With an all-star cast, a gripping air of paranoia and striking cinematography that captures the essence of Hamburg A Most Wanted Man, released on DVD and Blu-ray by Entertainment One on 19th January 2015, is guaranteed to keep you hooked through its twists and turns until its powerful climax.